The Hotel La Perouse tempts French Riviera visitors with its excellent location, its attractive architecture, and its four-star amenities. In reference to location, you can find this upscale boutique hotel set on a promontory in Nice overlooking the Bay of Angels. The atmosphere is relatively quiet in comparison to the hotels that are situated directly along the promenade. Guests are more likely to hear birds singing than the sounds of traffic. In regards to the Hotel La Perouse architecture, the hotel has the look and feel of a patrician mansion and exudes plenty of historic charm. This doesn’t mean that modern amenities are lacking. Contemporary furnishings, satellite TV, and Wi-Fi internet access are just some of the standard amenities in the rooms and suites. 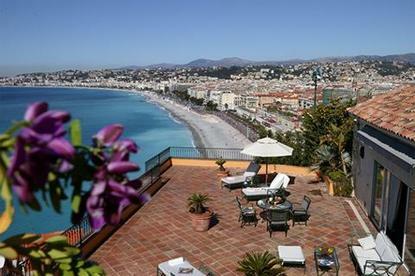 Among the Hotel La Perouse’s most alluring attributes are the views that it offers of the sea. Many of the rooms and suites have private terraces with sea views, and prospective guests are encouraged to consider such accommodations when booking their stay. It shouldn’t be a huge deterrent if units with sea views aren’t available, however, as each and every room or suite at the Hotel La Perouse is spacious, comfortable, and well-equipped. Outside of the rooms and suites, guests of the delightful Hotel La Perouse will find a nice array of facilities, including a restaurant that serves up Mediterranean cuisine and a seasonal outdoor pool. Only serving to increase the appeal of the Hotel La Perouse are its available services. Highlights in this department include laundry services, room service, and the option to have buffet breakfasts delivered to your room or suite. As a side note, the Hotel La Perouse is known to offer lodging packages that can prove to be quite tempting. The simpler packages that are commonly made available include breakfast, and guests can often book half board packages that include breakfast and either lunch or dinner. If you want to take things further, you can see what other packages are available. It is common for the Hotel La Perouse to offer lodging packages that include meals and French Riviera cultural passes, for example. Either way, booking a special lodging package can be a good way to maximize your overall Hotel La Perouse Experience.